The Philadelphia Flyers had a spot open for the third-line center coming into training camp and the preseason. 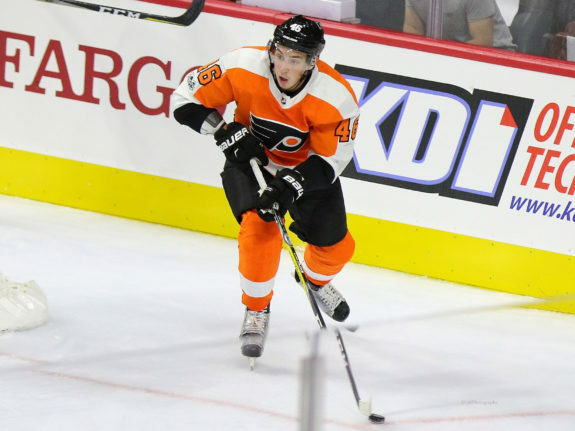 Veteran Jordan Weal was expected to fill that role, but 21-year-old center Mikhail Vorobyev had other ideas. 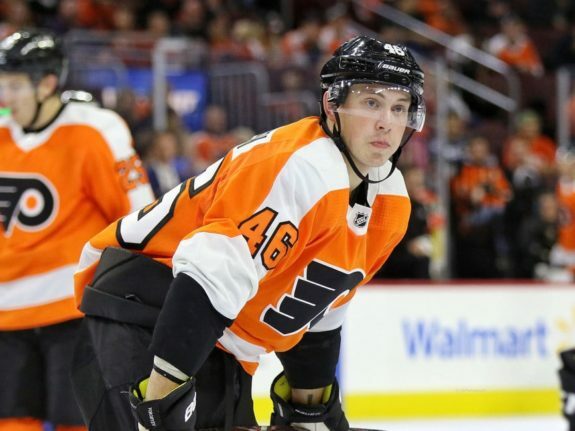 Vorobyev impressed so much and was so consistent in the preseason that he is the Flyers’ starting third-line center, while Weal seems to be the extra forward. Vorobyev came into camp flying under the radar for the third-line center job behind, at the time, Scott Laughton and Jordan Weal. The Flyers have since then decided that they like Laughton better on the left wing, so that eliminated him from the third-line center competition. 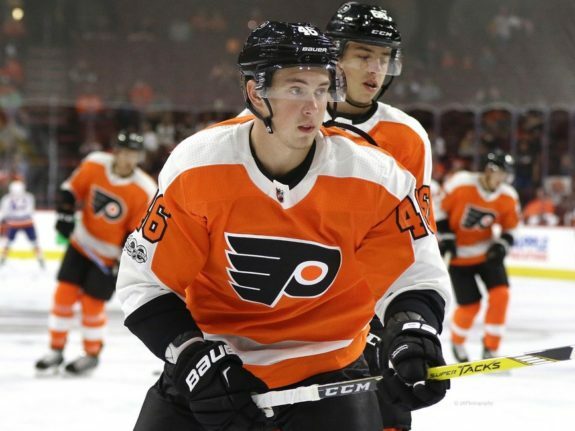 Vorobyev then went to work, and it became apparent from the first game that he was coming after Weal and wanted to win a roster spot on the Flyers. The 21-year-old showed off his set of skills and impressed from the time he hit the ice. The center played in seven of the eight preseason games. In those seven games, he had two goals, five assists and seven points. 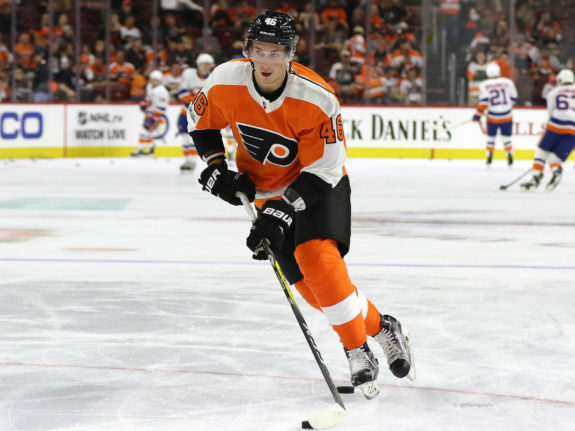 Vorobyev led the Flyers in games played, assists and points in the preseason, and that got the coaches to notice him. He played in almost every situation and was moved up and down the lineup. In a few games, he was able to play with Claude Giroux and Travis Konecny, replacing the injured Sean Couturier, who played in the final preseason game and is good to go for opening night on Oct. 4. Vorobyev also seemed to develop some chemistry with James van Riemsdyk and looks to be starting the season as his center. During the preseason, he seemed to do a ton of little things right, and it seemed like there was more than one Vorobyev on the team. The center always seemed to be in the right place at the right time, showing off his hockey sense. He kept up with the speed of the NHL game while breaking up plays and forcing turnovers by the opposition. Vorobyev knows when to use his size to his advantage, like to win a puck battle along the boards or rub a guy off the play. The center has really good hockey sense and anticipates where the play could be going, which could eventually allow him to get some time on the penalty kill. Vorobyev makes good decisions whether to pass the puck, shoot the puck or find the open man with his vision. In the last preseason game, he was along the boards, spotted Taylor Leier in the slot, and threaded the pass to him for the eventual goal. He also has some sick stick-handling skills that were put on display with some dekes to make plays. Vorobyev played up and down the lineup during the preseason, from the first line to the third line. It seemed like he had an impressive game no matter where he played or who his linemates were. Vorobyev looked really good playing with Giroux and Konecny when he was placed on the top line with them. The center was used on both special teams units, but he did seem to get more power-play time than shorthanded time. Vorobyev did develop some chemistry with van Riemsdyk in the preseason, where he played with him at even strength and on the power play. Van Riemsdyk was originally thought to start the season in the top six group of forwards, but the chemistry just didn’t come with Nolan Patrick and Jakub Voracek like it did with Vorobyev. If Couturier or Patrick get hurt this season, I could easily see Vorobyev as an option for the role second-line center. The year in the minors with the Lehigh Valley Phantoms really helped Vorobyev come in prepared for camp and preseason. In the 2017-18 season, he played in 58 games and had nine goals, 20 assists and 29 points. During the 2018 Calder Cup Playoffs, he had one goal and one assist in nine games. He was not much of a factor during the playoffs, but he could have been starting to get fatigued by having already played in 58 games during the regular season. Plus, the Phantoms played a five-overtime game against the Charlotte Checkers in the playoffs. The time in the AHL also prepared him for the longer schedule. The biggest thing for the Vorobyev was that he was able to get used to the smaller North American ice. Some of the rookies and younger players have difficulty adjusting to the smaller ice size, but with the year in the minors, Vorobyev was able to come into camp prepared. He was also able to get used to the North American style of play and to the speed at which the game is played. Vorobyev got ice time that he would not have received should he have won a roster spot with the Flyers last season. He may not win the Calder Trophy for best rookie, but Vorobyev will make some noise throughout the season. The center is going to cash in on playing with skilled, veteran wingers and hopefully will deposit 20 goals into the back of the net and finish the season with 50 points. There is no doubt that the rookie will have his ups and downs throughout the season, but he will get through the rough patches. I wouldn’t be shocked if he found himself on the special teams units, especially since he has good vision on the ice and is defensively sound. Vorobyev is a two-way center who can put up some points and won’t be held back by the coaching staff like most young players on this team have been at one point or another. I feel like the coaching staff will treat this kid like Ivan Provorov—whether he makes a mistake or has a bad game, he will be right back on the ice for his next shift to see how he responds.